I once read a fantasy novel that, via various plot machinations, involved a 9th century woman from the Russian Steppes becoming the daughter-in-law of a 20th century Russian immigrant to Canada. The male protagonist was understandably somewhat concerned as to how these two women in his life would get along, but was immediately reassured when he came upon them in the kitchen. “What surprised him was her instinctive grasp of what Mother needed her to do. She seemed to understand loading and unloading the dishwasher immediately, even though no one had explained to her what the dishwasher was or what it did. She seemed to know what tool Mother wanted and, most amazingly of all, where it was in the kitchen. To my credit I did not throw the book across the room. I can barely find things in my mother’s kitchen, much less instinctively finding anything in someone else’s kitchen. Usually in someone else’s kitchen I end up wandering around opening every drawer and poking into cabinets trying to find a knife only to realize they keep them in a knife block on their counter. There is no mystical understanding of women in the kitchen. I’ve lived with my roommate for the better part of eight years, and when she cooks she still comes out of the kitchen to ask me where things are. I’d like to think that my kitchen is organized in a logical fashion, but I recognize that it’s a wholly internal logic that makes sense only to me and frequently not even then. Why the potato masher, the pastry brush and the baster are all in the same drawer, while the spatulas, tongs and soup ladles are in another owes something to logic and something to the pragmatic reality of where they happen to fit. This has nothing to do with what I made for Dinner this week, it’s just a quote that’s always stuck with me as being completely nonsensical and clearly written by someone who’s either never tried to find something in an unfamiliar kitchen or has a wife with deeply magical powers. In a food processor pulse the bread until you have bread crumbs. 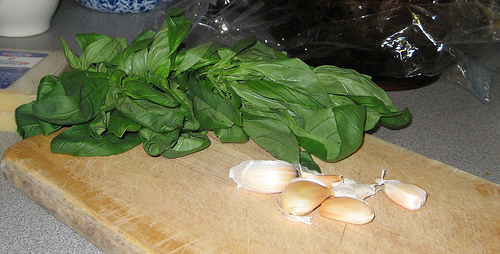 Add the basil, garlic, and gruyere and pulse until everything is finely chopped. Season with salt and pepper and pulse briefly to combine. Add olive oil in a stream until the topping just holds together. You’re looking for a texture in between bread crumbs and pesto. * This is a more or less arbitrary amount of basil and represents the size of a large packet of basil in my grocery store. 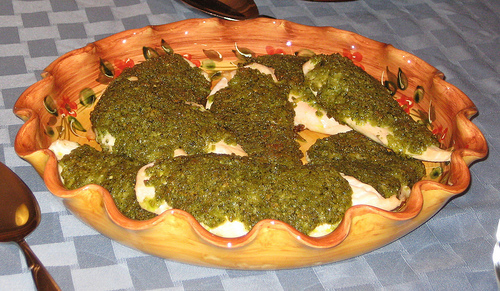 You can also add parsley if you like. 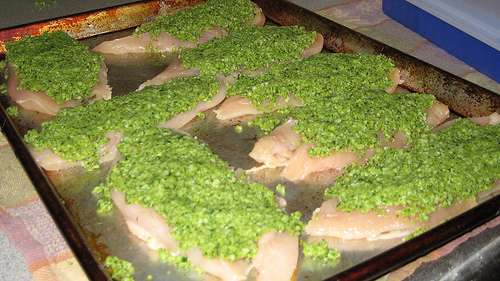 Butterfly four chicken breasts and place on a lightly oiled rimmed baking sheet. Place about 2 Tbsp of topping on each piece of chicken and pat down to form an even layer. Bake at 350 for about 15-20 minutes until the chicken is cooked through. Notes:	You can make the topping a day ahead, but the green of the basil will turn a little muddy, and it’s so easy to do that it’s not really worth doing it in advance unless you’re going to be really pressed for time when you’re making dinner.